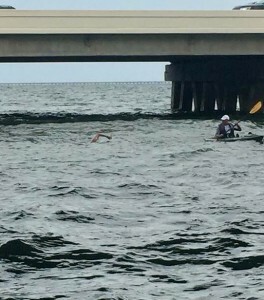 I went back and forth for several weeks wondering if this 24 mile swim was something I could complete – and by complete, I mean finish in a decent time and without injury. Normal concerns for a race you have never done, or waters you have never swam in, or the longest race distance to date. My race partner and best friend from Australia agreed she would join me a in 2 person relay, and we began to train in December. Those self doubts did creep in over the weeks, but in the end we decided together that the only way we would ever know if we could complete this race was to give it a go. No telling otherwise. I took this thought and made some tiered goals. 1, finish safely and have fun doing so. 2, 12 hours would be a great target. 3, under 12 hours would be a bonus. Of course you are at the mercy of some unpredictable and uncontrollable factors in open water swimming, so the goals were floating. At the end of the day, whatever we were dealt with, take it and don’t make it worse by things you can control – nutrition, hydration, temperature control, motion sickness, and above all mental clarity. Training for me was built around a busy work and family schedule, and I was most happy with remaining consistent during this time. 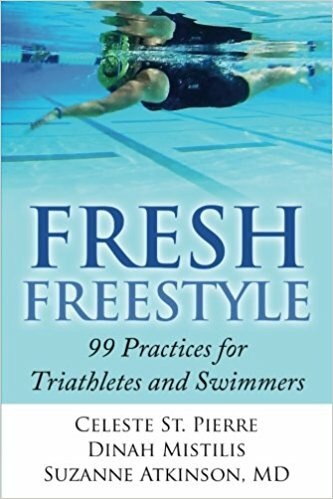 I sequentially increased swimming time, made a list of swim focal points to prioritize, and tested nutrition and medication. I did the bulk of my training in the Endless Pool, not being able to get into the lake with the cold winter temperatures. Every session involved visualization of the race itself – I had studied maps and videos of the race and read race reports. 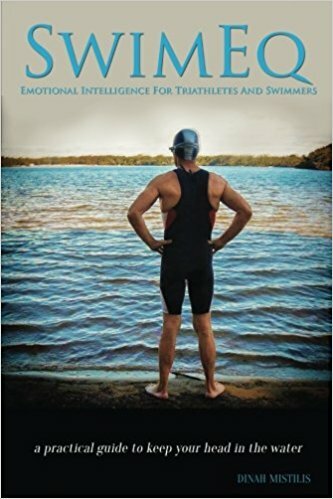 Every session involved ways to strengthen my emotional intelligence – training my brain to remain calm no matter what the situation was. I felt prepared for race day. A few days before the race we began looking at the forecast. It looked ok, some light winds and swell. Such a big part of open water swimming is the unpredictability of conditions, that can change in an instant. 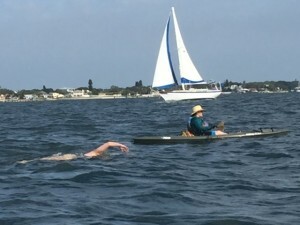 So neither of us were surprised when April 22nd arrived and off we went, St Petersburg to Tampa, up the Tampa Bay, swimming in 6 very distinct sets of conditions. They were 8mph headwinds and moderate swell, crosswinds and large swell, tailwind and swell, dead flat, squirrelly storm swell with outgoing tide, and the final 2 miles of calmer rolling waves. A little something for everyone! The day was mostly overcast, and this combined with a vigorous sunscreen application schedule had us sun safe all day which is great…but I did miss the warmth from the sun during my down intervals in the boat. The land air temperature for the day was in the 80s, but out on the water in the wind, it was fairly cool. I was glad for the large thermos of hot water to keep my tea cup full and my insides warm all day. We swam the first half of the day in 30 minute intervals, then dropped to 25 minutes and then down to 20 minutes for the last 6 miles. I felt consistent and relaxed for the most part – just 2 sections where my mind got the better of me temporarily. The first was in the section of crosswinds and large swell – during this time our kayak and paddler were onboard the main boat dealing with a leak that had caused the kayak to capsize. 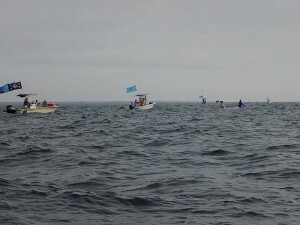 It was extremely difficult to navigate in the large swell, with poor visibility to the boats ahead. In the end, I decided the best I could do is try and go in the right direction, and not waste any more energy from becoming stressed and tense. It was nice to give myself that permission, and just swim on. The second time, was in between the Gandy and Frankland bridges. The water was like a washing machine, and again visibility poor coming up to the Frankland bridges. I was having trouble seeing the pylons, and aiming for the middle, I wanted to make sure I was not going to be smashed into the concrete by the waves. Rationally, I knew the kayak was going to guide me through, but that was not good enough at the time. So I slowed down approaching the underpass and took it pylon by pylon. Once under the first bridge I could relax back into my stroke and took the second bridge with ease. We were extremely fortunate to have friends on board the boat to support our swim – great crew makes the day so much easier! They were superb at keeping track of time, making sure we were drinking and peeing, eating and feeling good. 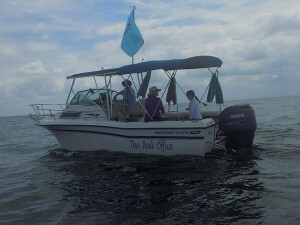 And our expert kayaker who guided us through the waters with communication from our seasoned boat captain. The whole team made the day a success. I am eternally grateful to them all. It was a pleasure to share the experience with them. Seeing the white sand of the beach finish was like nothing else. My husband and kids were there cheering us on, so proud and relieved to see us heading in. 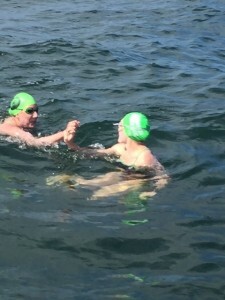 The final 50 yards were so shallow we walked in, taking our time and chatting about the day – the race director was giving us the hurry along to get out so he could clock our time (11hr32min) once we hit land. That really didn’t matter, we were enjoying the moment and what we had accomplished that day. I will never forget that feeling. Thanks Darls, great day, love ya! When I next find myself in a moment of self doubt, I will be reliving this experience from the early training weeks, to the sun setting on our race finish, and know that anything is possible if you give yourself a chance.